Lala Ji was a multi – faceted personality committed to the social cause. A dedicated patriot, he was a freedom fighter during the early years of his life. Later he grew determined to pursue the goal of education for the benefit of the hapless young Indians, then recently released from the clutches of the British Raj. With an active interest in politics, he became the Congress Member of Delhi’s First Legislative Assembly. The great visionary founded the twin schools, viz., R.B. 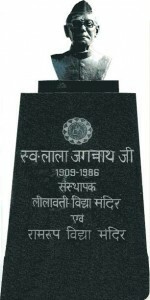 Ram Roop Vidya Mandir and Lilawati Vidaya Mandir named after his parents. Incidentally, Rai Bahadur Ram Roop, his father, is well known in North Delhi for constructing the famous ‘Ghanta Ghar’ in Old Subzi Mandi, Delhi. As an educationist, he also headed the Ramjas Foundation as President and was the Chairman of I.P. 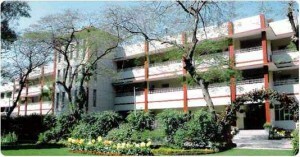 College and Hindu College, of the University of Delhi. Concerned for the underprivileged sections of the society, he also established a Dharamshala and a Homeopathic Clinic in Subzi Mandi, Delhi. Full of religious fervour, the philanthropist was the President of Shri Dharmik Ram Lila Committee for a long time. His rich legacy of confidence and resilience continue to inspire and guide several people whose life he had influenced in a benign way. The School, its trust and complex, were initially under its mother institution R.B. Ram Room School. It was formally given a separate governing body and hence an entity on August 31, 1973. The buildings of the two institutions stand next to each other. The founder Chairman of the schools Late Lala Jagan Nathji was a true philanthropist. The school gained new heights under the able guidance of Late Lalit Kumar Gupta, former Chairman, Late Sh Om Prakash, former Hony. Secretary and Manager and Late Smt D.M. Paul, former Principal. 34. Mrs. Sadhna Swami Asstt. Teacher 32 yrs.